Sensical Design & Communication is a small graphic design firm in Washington, DC, specializing in publication design for non-profits and financial-services companies. Sensical Design & Communication is a top graphic design, publication design, branding, and web design firm in Washington, DC specializing in publication design for non-profit and financial services organizations. Sensical Design is based in the Capitol Hill area of Washington DC. We provide a full range of graphic design services, including print publications, collateral, book design, magazine design, annual report design, branding, logos design, infographics design, and web site development. We have an excellent reputation in the community for tackling complex, challenging projects and delivering on time, on budget, and without drama. Call today at (202) 546-8049 or email info@sensicaldesign.com to learn more about how Sensical Design can improve your visual design. Happy New Year! We wanted to draw your attention to a project we worked on across much of 2014. The Pan-American Health Organization (PAHO) asked us to design their new internal procurement guide as an e-book. The guide runs about 80 pages and includes a variety of tables. It was first written and designed in English, then translated into Spanish, Portuguese, and French over the course of the year. We created a coordinated series of covers for the different language versions, with subtle color variations, as shown here. For each book, we created two version for each language, PDF and ePub/Mobi, to give users the widest array of options for using the guide, whether they have a desktop computer, tablet, or Kindle. Although the finished products look quite similar whether PDF or ePub, they’re quite different under the hood. Sensical Design was able to draw on our years of experience producing print and electronic publications to follow best practices, make the process simple, and complete the work on time and on budget. Over the last few months, we worked on a couple of complex book interior designs that are worthy of note. Sample images are at right (or above, if you’re on a small screen), and if you tap on them you can see them larger. The first two images are from the book Civilizations of the Unconscious by Dr. Nandini Dickens. This book is a scholarly work that offers a new attempt to decipher the mysterious, ancient Linear A script from ancient Minoan Crete. Because it’s a book encompassing both history and linguistics, it contains a large number of complex charts, maps and graphics, including the characters of Linear A, which had to be hand drawn. And because Dickens’ theory ties the script to Tamil, a language of southern India, there’s also quite a bit of Tamil. The final sample image is from the book How to Perform a WAN Qualification by Toni Schimmel. This how-to book for network engineers is in color and contains hundreds of diagrams, lists, and illustrations; the image at right only gives a slight taste. Schimmel also started this project with another design firm, in this case one operated by a large Internet company that you may have heard of. After months of back and forth and frustration, that company ended up refunding her money. Sensical Design finished up the project in good order, with no drama. See our publishing services page for more on how we can help you with your book projects, complex or straightforward. 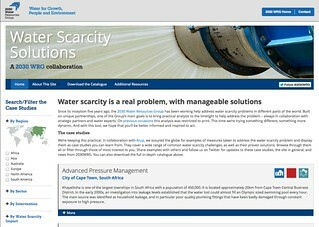 Sensical Design was asked to create this special-project website for the 2030 Water Resources Group. 2030 WRG had developed a printed catalog of case studies of their international work helping governments meet water-supply challenges. We were asked to translate the material into a website that would put the case studies into a searchable, filterable database on the Web. Users can open up items they are interested in learning more about or download the full case study as a PDF. The site was built on the Expression Engine platform using an agile development process (simultaneously working on the design and the programming) that allowed us to go from conception to launch in only six weeks. The site was also designed to be mobile-friendly and responsive. You can see the live site here. 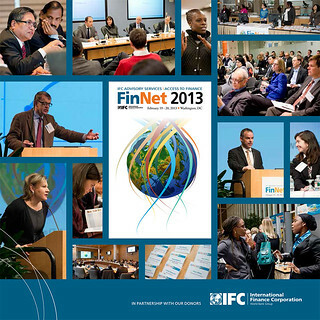 Sensical Design was asked to create an interactive ebook as a follow-up to the International Finance Corporation’s 2013 FinNet Conference. Although the subject matter is the proceedings of an international development conference, the client wanted a lively, magazine-like feel that emphasized the images and graphics rather than the text. The 64-page book is filled with photos of the event, brief summaries of the various panels, and links to videos of the major presentations. Interactive graphics are sprinkled throughout the book as well to add visual interest. The ebook was produced for the Zmags platform, using their new HTML5 viewer, which allows for a consistent user experience across desktops, iPads, and other mobile devices. You can see the whole book here. In branding work, sometimes small changes can make a big difference. We were asked to redesign the logo for 2030 Water Resources Group (2030 WRG), a public-private-civil society partnership that works internationally on water supply and access issues. They had an existing logo (right, above) that didn’t suggest water, and was not easy to work with. We were asked to design something more appropriate but that still referred back to the original in some way. Our solution, as seen at right, was to separate the text from the color bars and change it to a more readable mixed case. We added a curve to the bars and perspective to the edges, and subtly adjusted widths and spacing for a three-dimensional effect. The resultant shape subtly evokes a waterfall, and can also be read as arrows leading into the future. We retained the existing colors (with slight tweaking) and the original font, Gotham, to maintain continuity, but the final logo has more presence on the page, reads better at small sizes, and is more distinctive and appropriate.